Size 10 Hearing Aid Batteries. Pkg of 8 Batteries. Hearing Aid Batteries - Size 8. 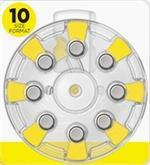 Pack of 10 Batteries. 1.45 volts each. Mercury free. Replaces all size 10 Zinc Air Batteries. Size 675 Hearing Aid Batteries - Pkg of 8 batteries. Size 675 Hearing Aid Batteries - Package of 8 batteries. 1.45 volts each. Color code BLUE. Mercury free. Replaces all size 675 Zinc Air batteries. 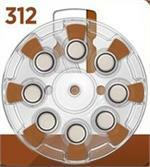 Size 312 Hearing Aid Batteries - package of 8. Size 312 Hearing Aid Batteries - package of 8. 1.45 volts each. Mercury free. Replaces all size 312 Zinc Air Batteries. Battery color code BROWN. Size 13 Hearing Aid Batteries - package of 8. 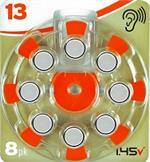 Size 13 Hearing Aid Batteries - package of 8. 1.45 volts each. Mercury free. Replaces all size 13 Zinc Air Batteries. Battery color code ORANGE.